The edge guide is a basic router accessory that's particularly useful for cut-ting grooves. Some manufacturers include an edge guide with the router, others charge extra for it. Some routers have good edge guides, others have lousy ones. 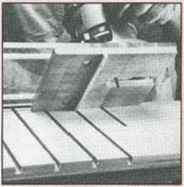 l*tukmaw«.a£u slides t'm' xc.v»" oak •m- »wa&yt qa.k v* ' • v»' * 6 v»* 0*k imstall slices with two •2 xw* screws. 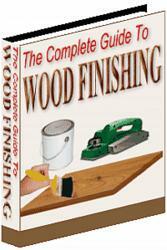 A major limitation of the edge guide is its need to reference an edge. So try this: Make a shoe that'll slide in a previously cut dado or groove, and reference dial cut. This is a practical way to knock out evenly spaced dadoes for shelves in bookcase sides, or slots in a tape or CD storage box. 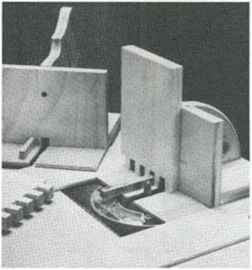 The drawing here shows one way of making the slide and mounting it on the edge guide rods. To cut a series of closely and evenly spaced dadoes, modify• the homemade edge guide with a strip to slide in a just-cui dado. That way,you can position each new dado in relation to the previous one. It's a lot faster than setting a T-square for each cut. Elu makes an excellent edge guide for its plunge routers. The shoe has an easy -sliding plastic facing. The locking knohs are easy on the fingers, and they seem vibration-proof—they don't work loose unexpectedly. Mr. 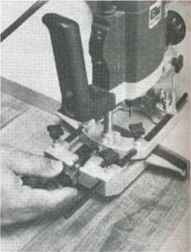 Hands has his thumb and finger on the adjusting knob you use to fine-tune the guide's position. piece, guiding the router in a path parallel to that edge. The best edge-guide designs allow you to install two guides on those rods, one on either side of the bit. They have knobs rather than thumbscrews, and those knobs set the guide securely. The router's vibrations won't shake them loose. They have provisions for you to add auxiliary faces to the guide(s). T his edge guide features a wooden shoe attached with two carriage hoits to an elongated acrylic baseplate. The plastic knobs are easy to grip and (urn, so you can set the guide securely without trouble. 2 pes. 1 Y*" dia. plastic knobs, with V"
49444 (800-253-0421 ). Part #DK-54. 1. Dress the hardwood (we used maple), sand it smooth, and glue the pans together. 2. Cut the acrylic, rounding off the sharp corners. Sand and polish the edges if desired. Cut the slots with a Winch straight bit. 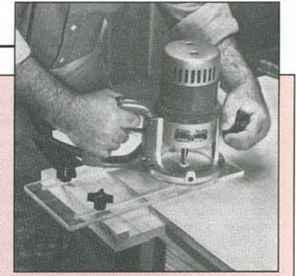 This is easiest to do on the router table. 3. 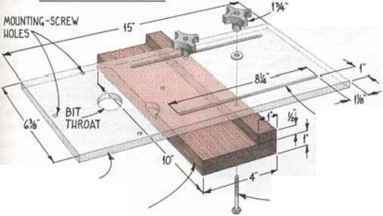 Using the factory baseplate as a template, lay out the router location, the bit hole, and the mounting-screw holes. 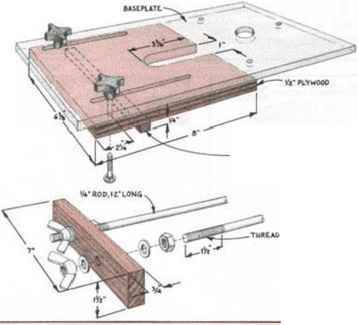 Give some thought to the orientation of the router handles in relation to the plane of the guide. Cut the bit hole, and drill and countersink the screw holes. 4. 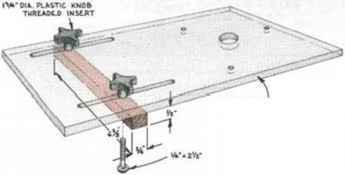 Set the maple edge guide under the baseplate, and mark the locations of the carriage-bolt holes. Drill and coun-terbore the holes. 5. Insert the carriage bolts into the guide, and tap them home with a hammer. Insert the projecting studs through the l>ascplaic slots, drop washers onto them, and turn the plastic knobs onto them. Mount the unit on your router in place of the factory baseplate.